Taking the cats to the shot clinic this weekend really reminded me why I should never leave the house with my pets. It was as stressful and frustrating as I thought it would be. I honestly don’t know how Gigi has managed to move across Europe with Pablo and Tobias. The easiest part of the day was dropping Isobel off at my bestie’s on our way to the clinic. She obviously had a great time there and didn’t miss us at all. She even felt at home enough to tell their cats “NO!” repeatedly. She’s thoughtful like that. 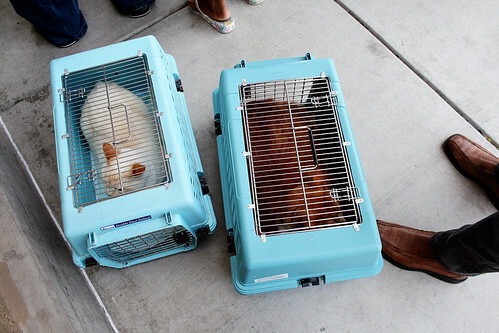 My mom literally saved us by letting us borrow the cage-type carriers she uses for her trap-neuter-return program. 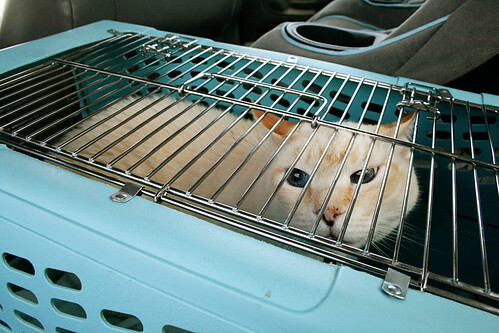 The last thing I wanted to worry about was Peaches eating his way out of the carrier again and running amok at the clinic. The first time was bad enough. And I had never put Zorro in a cardboard cat carrier and I was not at all sure it’d be up to snuff for lugging his 25lb-carcass around. I can just picture the bottom collasping and orange cat going everywhere. Zorro was pretty cramped in the cage carrier, and we had to hold it from the bottom or the handle would break, but we did it. 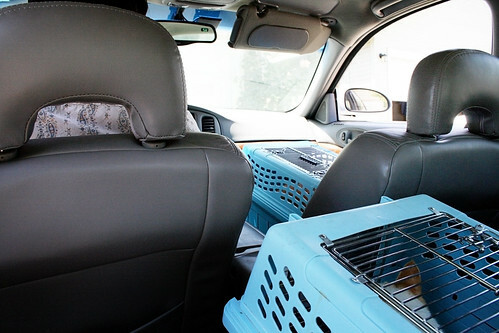 As soon as we put them in the car Zorro started howling. Not his typical tiny-cat meow, either. Full-on, top-volume mrowling. I waited in the car with them while Anthony stood in line and Zorro kept it up the entire hour. Peach however, remained pretty calm, but clearly trying to escape from the cage, testing the bars and scratching at the corners. He’s been to the vet and the shot clinic many times, plus one time our neighbor took him to the pound, so he’s been on lockdown before. He probably has PTSD. 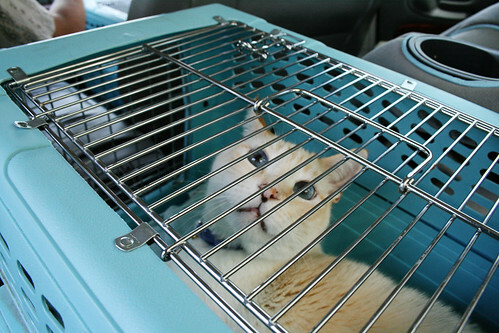 When Anthony gets near the front of the line we get the cats and wait to see the vet. She is quite astonished by Zorro’s size and he takes the two vaccines calmly. We do Peach next and when the vet sees him she remarks, “Oh! You have a little one, too!” Now, I wouldn’t call an 18lb Manx little, but after seeing Zorro your perspective tends to be a bit skewed. Zorro took his shots with no complaints but as soon as Peaches is out of the box he starts yowling and fighting back. It’s all the vet and I can to do hold him down. Finally, we are done. We pack up the cats and head home. Zorro seems eternally grateful to be back and Peaches seems laid back but is actually quietly biding his time. Turns out he had a plan: later that day Mr. Peach takes his revenge and urinates on my side of the bed. 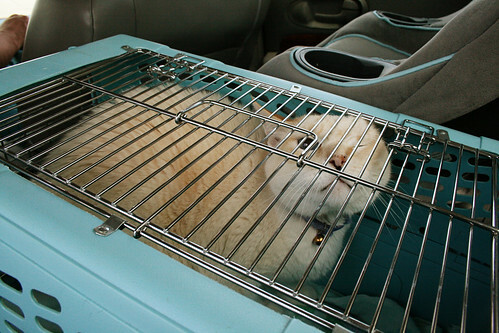 I have a cage like that for my cat. We got it for Toby as a kitten though… and stupidly got a small one. Poor Kitty can hardly move when she’s in it, but it’s so easy to get her in there. Make sure the lid is latched properly though! My mom had to bring her to Sudbury since the work ont he house was taking longer than planned and she needed her insulin. While bringing her from the car though, the lid popped open and cans of catfood fell on her! Luckily we were able to get her in the house though. She’s nornally surprisingly good at the vets. Maybe just too scared to move much though. Your Zorro reminds me of my mom’s cat, Frank. He’s a 35 lb Russian Blue and he is so loud when he’s scared. And super strong! If you’re in the way you will be run down.